What is actually a neighbourhood in the Porto area? Which are the spaces or systems of multiplicity, plurality, proximity, clustering of services, meeting points and shared public spaces? What binds us, collectively? Where do we meet and interact with each other? What kinds of spaces do we need, and how do we design and plan them? How can Porto benefit from this, and re-invent itself by using the intelligence of neighbourhood design, in northwestern Portugal’s dispersed urban landscape, where the culture of neighbourhood design is practically absent? 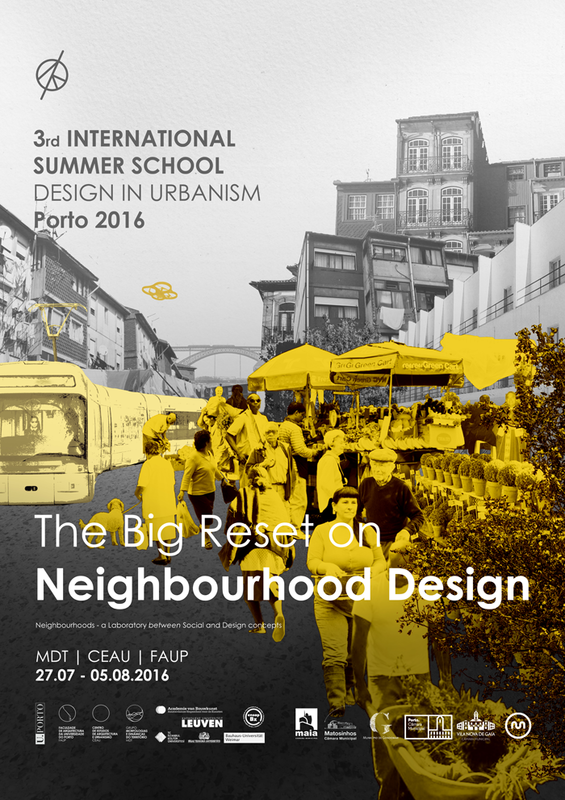 The third edition of the european Summer School will proceed with the debate on neighbourhood design. After the extremely successful start in Amsterdam, in 2014, and the fruitful re-edition in Istanbul, in 2015, this year, the Summer School will take place in the city of Porto. The ten-day summer school - European Intensive Programme – will consist of lectures, intensive workshop and critical debates. Students will work in international teams, debating and confronting their experiences and cultures, seeking to highlight new perspectives and approaches on the neighbourhood concept and design. It is expected a critical reflection on the issue, triggered by practical experimentation in the Porto context, which also implies the recognition of this particular urban reality and the understanding of its development processes. The programme, challenging the role of urban planners and designers, is based on the idea that the contemporary neighbourhood is not a static concept, but rather a fluid notion open for multiple interpretations. It intends to question if a neighbourhood can be designed and planned. Is a neighbourhood a particular urban area with a defined target group of inhabitants and users? Or is a neighbourhood a more complex and open idea, grounded on the way people use the available network of public spaces? This last assumption points to the idea of working with the collective system of spaces and the facilities that enhance their individual capacities: the network and the multifunctional places. Teresa Calix; Daniel Casas Valle; Daniel C. Carvalho; Suzana Araújo; Maria Ludovina Vale. Grupo de Investigação Morfologias e Dinâmicas do Território do Centro de Estudos de Arquitectura e Urbanismo da FAUP (MDT/CEAU/FAUP). Fundação para a Ciência e a Tecnologia (FCT); Compete 2020; Portugal 2020; União Europeia (UE) - Fundo Europeu do Desenvolvimento Regional. Amsterdam Academy of Architecture (Holanda); LUCA School of Arts - Faculty of Architecture (Bélgica); École Nationale Supérieure d'Architecture et de Paysage de Bordeaux (França); Glasgow School of Arts - Mackintosh School of Architecture (Reino Unido); Istanbul Kültür Üniversitesi - Department of Architecture (Turquia); Riga Technical University - Faculty of Architecture and Urban Planning (Letónia); Bauhaus Universität - Faculty of Architecture and Urban Studies (Alemanha). Câmara Municipal de Gondomar; Câmara Municipal da Maia; Câmara Municipal de Matosinhos; Câmara Municipal do Porto; Câmara Municipal de Vila Nova de Gaia; Metro do Porto.